Landfill liners are essential for protecting the environment from landfill waste contamination. Using only the best quality landfill liner materials is very important since preventing any leak from happening should be of the highest priority. A landfill liner helps prevent the migration of leachate and toxic byproducts into top soil, and guards against penetraton into aquifers or nearby rivers and the contamination of other local water sources. Landfill daily covers are also often used to offer a second protection from contamination. These can also be used to retain gases that are produced by byproducts and can enable these gasses to be used for the conversion of electricity. 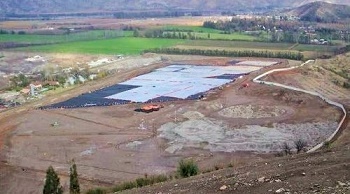 Additional landfill rain covers are commonly used to prevent rain from causing runoff and possible migration of contaminants into other areas. Western Environmental Liner offers several different options for Landfill Liners, caps, & covers. The most commonly requested landfill liners & landfill caps at this time is our PVC line. Our PVC has excellent weld-ability, elongation and conformity. It is also highly impermeable, which is a very important factor when it comes to landfill containment. We offer very large panels to cut down on costly installation and help lower any chances of possible leaks. For landfill covers, often called rain covers, we commonly recommend our high quality aqua series of RPE liner. Our Aqua series line offers excellent tear resistance and makes for an excellent tarp or cover. Please contact a landfill liner manufacturer for your landfill liner needs. We will ensure that you are provided with the best landfill liner material option available.